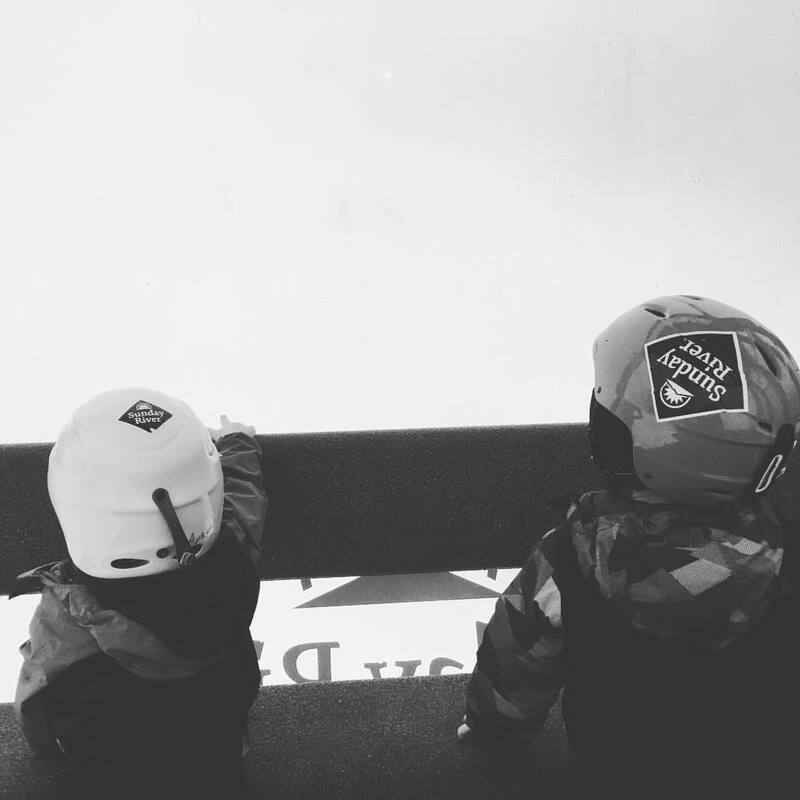 Taking toddlers skiing is daunting. It also can be awesome. Here is a list of things I learned from trial and error (mostly error) to make your trip a happier one. Happy skiing!! The first time you put your kiddo in boots, they might cry. And Fall. Walking might be frustrating and slow for them in their boots. Just getting them and all their stuff to the carpet lift might take an epic amount of patience, and getting onto the lift the first time might require divine intervention. Go in expecting that the first three runs might be rough, and plan for a cocoa break after #3. The upside is that their center of gravity is really low and most kids are eager learners, so sometime in those 3 rounds they will probably start getting the hang of it. Celebrate small victories and cheer them on loudly. Try your best not to get frustrated. Once they start getting it, the learning curve is steep and you get to sit back and be a proud parent with a camera and some more coffee. An Edge Wedgie, $9, it a clip that holds the front of their skis together so they can’t lose control with their legs everywhere. Ski straps, $7, are velcro straps for carrying skis. You’ll be carrying your skis, your poles, their skis – plus any extra clothes, gloves, snacks, diapers, etc….and maybe a crying kid. Make life easier and get straps. A ski harness, $39, is for when your kiddo starts getting fast on the slopes. Look for ones that secure to their boots and not their back – that way, you have more control over their skis and aren’t pulling them back off their balance like you would do with a backpack-style harness. Mabel’s labels makes labels that work great for skis – and backpacks, water bottles, clothes, and anything kid-related that needs labeling. If you don’t have time to order them, masking or painters tape works great. Before a trip, check the weather report for the mountain, lest you drive 2 hours with impatient kids only to be completely rained out. Try and get them to sleep in the car on the way to the mountain, and maybe put them to bed a little early the night before. Sleep deprived kids and learning don’t mix. Try and hit the mountain when it won’t be crowded. Weekdays will obviously be less crowded than weekends, but the time matters, too. The earlier you get there, the less crowded the slopes will be, including during the week when school-age kids pile in around 3 p.m.
Bring extras of everything – but leave them in the car. The less you are lugging around, the better. Bring one adult per child who isn’t a steady skier. Trying to teach two at the same time is too hard. Have EVERYONE use the potty before going out. It might be smart to stay in your winter boots instead of skis the first few rounds down the bunny hill so you can get around easy to help them when they fall. Bonus Points: I always see moms and dads with a baby in a carrier, walking with their older child learning to ski on the bunny slopes. That is some beast-level parenting right there. First, it is worth driving around for a good parking spot instead of taking a bus with wild toddlers and all their stuff from an overflow lot. Also, you can make runs to your car for replacement gloves or nap time. Get a map and plan your runs. Wachusset has a baby bunny hill to the far right, then a bigger bunny hill to the far left, plus a great green trail via lift right next to that. Sunday River has one bunny slope, and then 2 or 3 gentle green trails all on the far right side. Put all your stuff close to where you plan to be. On lifts: You MUST have skis on to ride lifts (exiting in boots is unsafe.) You can use a ride on the lift as a reward if you need to and you think you can make it down a run with them. Some resorts have glass-enclosed gondolas – these are amazing boot-friendly and kid-friendly rides that are all the bargaining chips you’ll need for the day. I bought both my littles the Maxx Pass during the flash sale in April for $30 each, which gets them 5 days at 40 different mountains. That is cheaper that a single day-pass at any of those mountains day-of. Mark your calendar. Booking ski school early can save you about $10-20 a lesson. I have arrived on the mountain with 3 pairs of gloves for each of my kids, all their equipment and snacks, plus all their jackets and pants and socks…only to not even bring a coat for myself. Any trip like this (beach, museum, zoo – same thing) is really taxing on parents. Be sure to get an extra cup of coffee, double check your bag along with theirs, and be good to yourself. You’ve got this. One extra note about you – your feet may have grown with pregnancy. Mine grew 2 full sizes. Make sure your boots, rented or your own, are the correct size before you embark on your ski adventure. Sore feet will definitely put a damper on what could be an epic day. Build fabulous family memories of skiing together and then cuddling by a fire with cocoa re-telling stories about how awesome your kids skied that day. 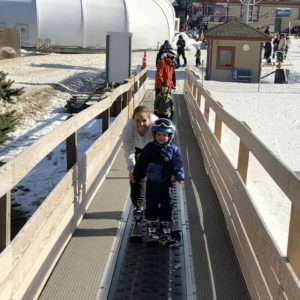 Play games on the lifts together, take lots of pictures, and enjoy the glee of a great run with your kiddos.